My better half gave me a sampler of the historic ales from Scotland. This sampler pack is from Williams Brothers Brewing Company, a Scottish brewer that began “operations” in 1988 using a single recipe and space at a 5 barrel brewery. Today, Williams Brothers is the sole remaining brewer in Alloa, Scotland and has a line-up of 24 beers. A part of this line-up consists of the 4 bottles from the sampler. Made with such fine additives as elderberries, heather, kelp and pine, I wasn’t quite sure whether to thank her or quietly dispose of the sampler in the recycle bin. Not one to waste a beer, I chose the former and placed the bottles in the mini-fridge until such time as I had worked up enough nerve to give them a try. At New Year’s Eve, I gave the Fraoch Heather Ale and the Ebulum – Elderberry black ale a try. Now, it was time to break down and give the Seaweed Ale a try. While I am all for experimentation in the fermentation process, I have to admit that the use of seaweed had a bit worried. In an attempt to assuage my fears, I consulted the Williams Bros. website. Prior to the 1850’s Scottish coastal alehouses brewed with malted barley, grown in fields fertilised by seaweed. This environment gave the barley a very specific flavour which we recreate by the inclusion of fresh seaweed in the mash tun. A rich dark chocolate ale, which has the aroma of a fresh Scottish sea breeze and a distinctive malty texture. Appearance: Mahogany with light foam. Aroma: Roasted malt, chocolate, a little coffee, roasted nuts and dried fruit. Taste: A little thin, a little flat with a fair amount of sweetness and a slight acrid, coffee flavor in the finish. This looked and smelled like a beautiful beer. Unfortunately, it lost a little something in the bottle. I found it too be just okay and not all that remarkable. The last bottle was the Alba Scots Pine Ale. I suspected this would be more like a Belgian Ale with the obvious pine flavors and a lot of hops and after a quick consultation with the Williams Brothers site (they call it a “Tripel”), I was pretty sure I was correct. A traditional Highland recipe, popular in Northern Scotland until the end of the 19th Century. This “triple” style ale is spiced with sprigs of spruce and pine, harvested in the spring and brewed with only a small token handful of hops . Break out the goblets and pour with abandon. Rich, tawny and best enjoyed at Room temperature. Appearance: Cloudy, orange (like orange blossom honey) with a quickly dissipating foam. Aroma: Sweet malt, citrus and pine. Taste: Sweet and a little syrupy with a very citrusy (apricot nectar) flavor and a slightly tart, soft hoppy finish. This was undeniably the best of the four that I sampled. I would probably rank them Alba, Fraoch, Ebulum and Kelpie. The Alba tasted like a traditional tripel and had all of the flavor that one would expect from a good Belgian beer. Once again, I must thank my better half for her unique purchase as it provided me with an opportunity to try four distinctive beers. I am reminded of a certain British documentary involving, among other things, a silly French person known for having said something which likely inspired the Ebulum Ale: “yer mother smells of elderberries….” I have to go back and watch it again because I don’t recall an reference to these specific brews but there was something about a Holy Ale. Perhaps I’ll put in the viewing queue after the Crispin Glover Trilogy and A Scanner Darkly. I had that same sampler pack 5-6 years ago and was similarly suspicious/frightened at the prospect of a beer brewed with seaweed. Then I took some inspiration from Corona (just inspiration – not an actual Corona) and stuffed a chunk of raw tuna through the mouth of the bottle and considered it a sushi ale. Worked beautifully. Need to try it with hamachi next. Do you mean the following documentary? no no – that was the dramatic interpretation of the historical events. The documentary of which I spoke was far more faithful to actual events. I’m guessing the history classes at ‘Cuse leave a little to be desired as you clearly have a somewhat distorted view of “actual” events. Thanks for the review. 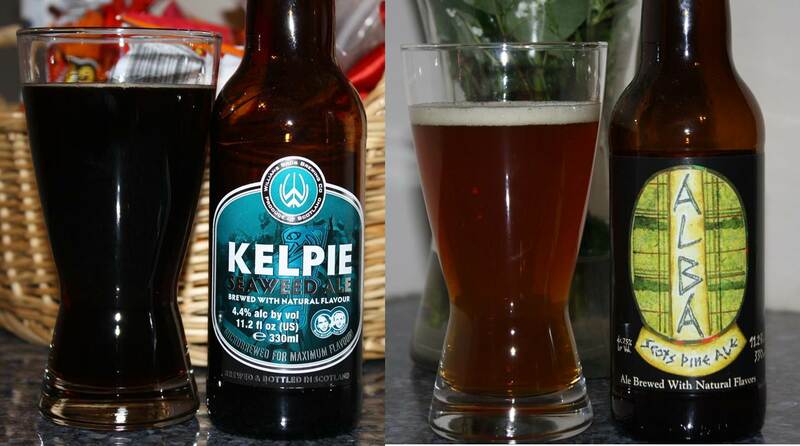 I am quite partial to the Kelpie—perhaps it just works better in a coastal setting, where I first tasted it. ; ) Very interested in trying the Alba now, too! I just wasn’t overwhelmed by the Kelpie. Maybe it was a little long in the bottle or maybe it was too well chilled. The Alba, on the other hand, was every bit as good as a traditional tripel.